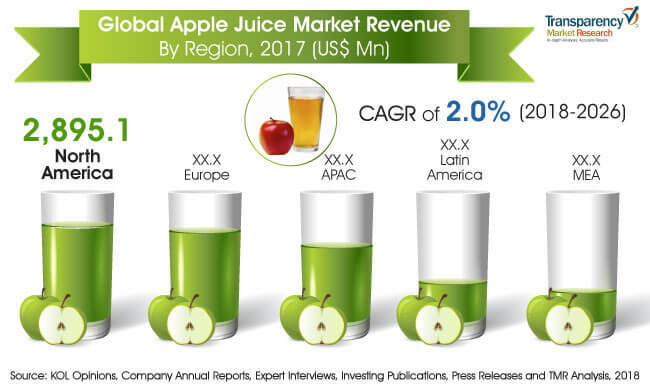 The global market for apple juice has shown sluggish growth during the forecast period starting from 2018 to 2026, as per the analysis done by Transparency Market Research (TMR). Apple juice protects the body from various diseases such as Alzheimer’s, it helps in keeping diabetes in control, maintains the cholesterol level, protect bones during menopause, and helps in reducing weight loss. Apple concentrate also provide relief from respiratory diseases such as asthma and various other it minimizes the risk from various cancer. The apple juice market has numerous companies working throughout the globe; some of the companies are The Kraft Heinz Company, Inc., Tree Top Inc., Parle Agro Pvt Ltd, Eden Foods Inc., The Coca- Cola Company, Britvic Plc, PepsiCo. Inc., Del Monte Food, Solana Gold Organics, White House Company and Manzana Products Co.
As per the TMR, the global apple juice market is expected to increase its revenue marginally from US$ 7.16 bn in 2018 to US$ 8.30 bn by the end of forecast period in 2026. Due to the sluggish developments, the CAGR for apple juice market is likely to reach around 2% during the forecast tenure. By nature, the apple juice market is bifurcated into conventional and organic. Organic segment is projected to dominate the market as reason of growing preference for organic food consumption in the vast population. As per geography, Europe and North America will lead the global apple juice market. Apple is one of the most recommended fruit especially by the doctors, and it is one of the widely cultivated fruits followed by grapes and banana. High nutritional content, vitamins, antioxidants, and dietary fiber have also created high demand for apples across the globe. Increasing preference and related health benefits have boosted the demand for raw as well as concentrated apples. Moreover, the demand for apple concentrate is increased as the shelf life of the apple products stays good for 1 to 3 years, depending on the type of concentrate used. Due to longer shelf life of apple concentrate helps for easy transportation and can be used for longer periods. Apple concentrate are also widely used by astronauts and by military personnel. The apple concentrate used for military personnel have a shelf life of 4 to 8 years that is three times more than that made for civilians. Thus, these factors will certainly boost the apple juice market in coming years on the global platform. Despite the numerous driving factors growing apple juice market, certain restrains may obstruct the market to attain its full potential. One of the major reason is on the supply side of apples, where farmer are facing difficulty in producing apple because of changing climate and natural disasters. Moreover, factors supporting the growth are unfavorable such as sudden change in climate, availability of water, and various other factors. Another reason decreases the growth is limited availability of apples to expand the business to meet the growing demand on the regular basis. Additionally, higher preference to consume raw apple has also decreased the availability of apples for processing industries. However, in coming period the market may grow by deliberately meeting these restrain.